Cutting the Cord and Cutting the Bills: Amazon Video On Demand - Another resource to cut the cord! 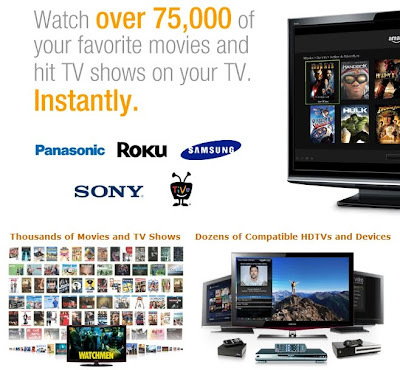 Amazon Video On Demand - Another resource to cut the cord! Amazon has been offering movie rentals for download and purchase for some time now. Originally branded as Amazon unboxed, it is now called Amazon Video on Demand. One of the major concerns people have when cutting the cord is getting access to the content that they want to watch. Amazon has quite a substantial library of Movies and TV shows to choose from and even offers them in HD (for specific players). Being a Netflix subscriber, naturally I am really interested in comparing the two services. One nice thing about Amazon is that they occasionally offer promotions and freebies. As part of my project with 3-D and my Media PC, I ordered Cloudy with a Chance of Meatballs BluRay 3D , about a week later Amazon sent me a $4 Video on Demand credit. I completely missed the "Special Offers" section below my order (next time I'll look more carefully for these gems!). Cool, a chance to play with Amazon VOD for free! I was actually surprised by what I found and think it is yet another great resource for people who want to cut the cord. I'll go over what I found and some of the nice features (as well as the problems). 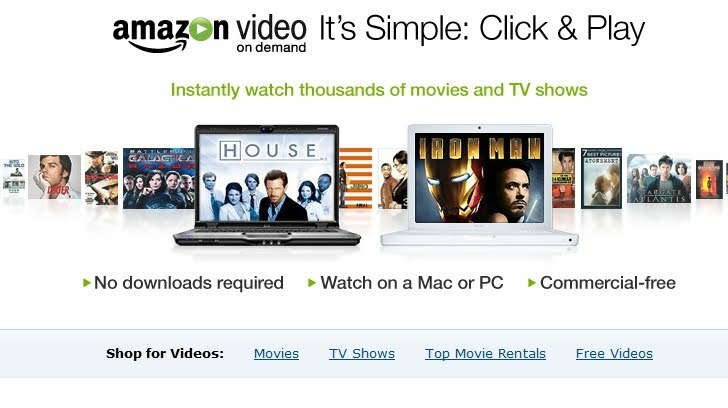 Amazon VOD is available on your PC (Mac or Windows) in a browser just like Netflix's instant streaming. This works great on a Media PC. If you have a supported BluRay Player, TV, Tivo or Roku you can also watch directly on one of these devices. Additionally, Amazon offers the unboxed (software) player to view videos offline that you've purchased. Unfortunately the player only works on Windows and you can't transfer your movies to other devices. I had no problems with Firefox on my Media PC. Note: Amazon uses Flash (as you would expect). Of course, none of this matters unless you can find something that you want to watch. Being a Netflix subscriber I can definitely say content is one of Netflix's Instant Streaming's weak points. Yes they have a lot of movies. Last I recall they claimed over 19,000 videos, but that was a few months ago. In any case, you can't go by numbers alone. If all of the movies are of no interest to you (or you can't find them), then the service is no good. Amazon claims over 75,000 and has an impressive list of TV shows in that list. It isn't hard at all to find content in Amazon's library that Netflix is missing (for instant streaming). Since there is really no reason why you can't use both services, this is all good news for us cord cutters. Choice, competition and diversity is a very good thing even if it means you must look in more than one place for what you want. Amazon's VOD pricing is quite different from Netflix. Here Amazon is much more like the Cable / Satellite VOD services that I'm used to. Movies typically cost $3 (for deals) or $4 (typically). You can also buy entire seasons of your favorite shows. At this price point, I'm not that tempted to rush out and rent all of my Movies from Amazon. I much prefer Netflix's model, but we get back to the problem mentioned earlier of who has the content. $4 is a whole lot cheaper than even one movie ticket let alone what it costs to take a family out! Amazon prominently advertises that they stream HD to compatible devices. You obviously need a broadband connection with lots of bandwidth to enjoy HD (> 2.5Mbits / sec). When you are browsing around their catalog, look for the "HD" blue bar at the top of the video before you rent. Looks like you need one of the devices listed on their website to enjoy HD. This isn't a big deal for me (Netflix was this way as well until a few months ago). In any case, the standard (480p) quality was more than acceptable on my Media PC even when viewed on a 65" screen. Plus, Amazon doesn't use Silverlight which seems to cause (or is related to) video stuttering problems when viewing Netflix's instant streaming. Give Amazon time and they probably will stream HD to PCs as well (and perhaps come up with a more tempting business model - like Netflix). After you get over the initial excitement of watching a video streaming online, you start to look for some of the standard features that you missed when you gave up DVDs. These features include subtitles and high quality surround sound. I played around with Amazon's video player (in Firefox) a bit, but couldn't find any features that related to sound output or subtitling. Now I have good hearing, but subtitles are important to me. I like to turn them on when watching late at night (so as not to disturb others). It is also nice on some foreign films that are in English. Sometime accents are tough to understand and subtitles help (especially when the volume is low). As for 5.1 surround sound, I've read that this is supported on Tivos and Roku boxes currently. Again, give Amazon time and there may be a solutions for PCs later. I'm not tempted to give up my Media PC or add more boxes to my entertainment center just yet. A Media PC is a better solution and worth the trade off for me. In addition to coupons and low priced movies, one of the things that can tempt me is a good promotion. I like Amazon's "Disc+ on demand" idea. You can purchase a DVD or BluRay and you get a free rental instantly. What a great option for collectors! You get your movie in high quality for your library and can still enjoy it right away. 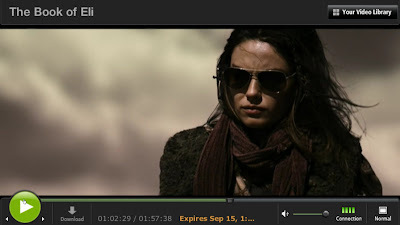 Unfortunately, Amazon doesn't offer this on all their movies, but "The Book of Eli (BluRay)" is an example. To browse their selection of promotions, go to their main VOD page, and look for "Special Deals", and "Disc+ on Demand". I'm impressed and I should have looked in to Amazon sooner. 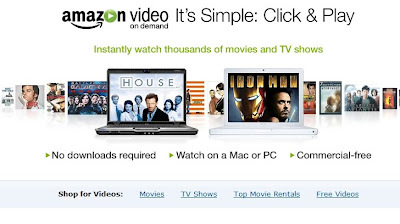 Amazon VOD is a no hassle, no monthly fee alternative to enjoying a movie instantly (or even downloading to own). Unlike Netflix, you don't have to commit to a monthly subscription. If you only want to watch one movie, you only pay for that movie. If you are a frequent renter, clearly Amazon VOD is going to be a more expensive option. However I see no reason why you can't take advantage of the promotions and/or use Amazon a additional resource (just like Hulu, YouTube, etc). There are lots of Amazon free promos during the beginning of the TV season as the studios seek to market their pilot shows. Amazon VOD is a good fit when you are trying to get caught up on a TV series. You can often get the older disks or streaming by Netflix, and then selectively catch up with Amazon.